Welcome to our web sight. in Nihonbashi where the fish market used to be. generation of the family that started it. So, I can say that we are one of the oldest sushi-bar in the world. 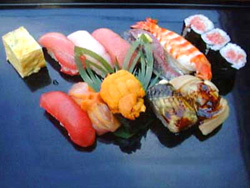 Many sushi-bar uses cultured fish these days. However, we are one of the rare exceptions. Especially, we use only the fish which were caught around this country. As you know, we have four seasons in Japan. Seawater also changes every season,too. We believe that’s why we can get several different kind and high quality fish all through the year around in this countory. We serve very traditional style of sushi. Especially, I recommend our sea-water eel called ANAGO in Japanese. It comes with our house made sweet sauce. I’m sure you will love it!! By the way, I’m Maki Ema and I’m the 5th generation of the family. I used to live in Seattle,Washington(USA) when I was a teenager. I made this web-sight in English. I really hope that each of you will understand our culture. I mean that the market is not an amusement park. There are some troubles between foreigners and us. We are really in hurry in the morning. Of course you are always welcome to our market! I hope you will study about our food culture through this market. I just want ask you to keep the rule here. When you come to Japan,please visit us! I hope you will enjoy the world biggest fish market,TSUKIJI. Maybe I can help you something for your sightseeing in Japan. I’m looking forward to seeing you at SUSHI-BUN. HOW WOULD YOU LIKE TO VISIT THE BIGGEST FISH MARKET IN THE WORLD? We Serve Very Traditional Style Of Sushi. The auction starts between 5:30 to 6:00 in the morning by the river side. You can see huge tunas and mny other kind of fish in the market. The fish you see here come from all over the world. When you visit the auction area, please do not make big noise and try not to use a flash light of your camera. It sometimes disturb their work. Please keep the rule and enjoy your visit. After you enjoyed the market, I recommend you to visit “Hamarikyu-garden” which is the most beautiful Japanese garden in this area. From the garden,you can take a boat to Asakusa. Asakusa has a lot to see .I’m pretty sure that you will love there. I hope you have a lot of fun visiting here and please understand our culture. We Recommend Our Course Menu. special quality 8different pieces of sushi and 3pieces of roll with today’s soup. extra-special quality 10different pieces of sushi,3pieces of roll and house madeomelet with today’s soup. * We make these courses very special charge, so we would like to ask you to order one course per one person each. Or we have a la carte dishes,also. We always have an English menu at the restaurant. please ask us for the menu. Sushi prices changes eneryday depend on the auction price. Please understand it. Copyright © sushibun All Rights Reserved.